The first time she visited on a trekking holiday, Gail was struck by the beauty of the country, and the serenity of the people of Ladakh, when she stayed as a houseguest with a very special family. She can hardly have known at that time the close links she would forge with the people, and the strength of the pull Ladakh would have on her in the years to come. She has re-visited the country many times since that first visit. “On my second visit, I revisited my family and was welcomed again into their lives. Whilst there, watching them work so hard, I felt I wanted to help. I started by sponsoring the education of their youngest son and also the son of another family in the village. I visited the principal of Lamdon School – Eshey Tondup – and talked about sponsorship. I had the idea of setting up the charity Himalayan Children – Helping on the path of life to enable more children to flourish, grow and enjoy an education. It costs around £9 per week for a child to board at the school. This is approximately £1.30 a day, which isn’t even enough to buy a cup of coffee in the UK. UPDATE : Thanks to your generosity, 39 children are now sponsored by Himalayan Children at local day and boarding schools. Gail is a founder and Trustee. Her enthusiasm, passion and commitment drive the work of the charity. 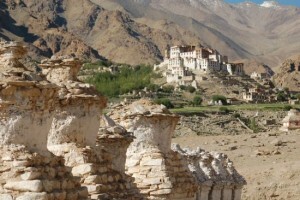 She works with the other trustees to ensure the aims aims of the charity are central to all we do and that the support goes directly to fund the work in Ladakh. Sandra was a founding Trustee, and has been our Accountant. Throughout, she has worked tirelessly on the accounts, and been instrumental in finding the most cost effective ways of transferring money directly to the schools. She has liaised with the various schools to ensure that the fees are paid on time, and with the auditor to submit the Trust’s accounts to the Charity Commission in the given timescale. The other Trustees are very grateful to Sandra for all her hard work, and support, and they wish her well, Although she is stepping down from overseeing the finances, her connection and commitment to Himalayan Children will not cease as she will continue to sponsor the education of two children. Rinchen is a remarkable Ladakhi woman, living in Leh, who works on a voluntary basis for Himalayan Children in Ladakh. Rinchen has worked in various Government organisations, working tirelessly to support the rights and welfare of women through the Ladakhi Women’s Alliance. Rinchen is the local ‘eyes and ears’ of our charity. She co-ordinates Gail’s regular visits to Ladakh, acts as a translator, liaises with the different village leaders, schools, and helps to develop the essential local links which are fundamental to our work in Ladakh. Ailene is a trustee and also support aspects of the charity’s communications through her report of fundraising event and the management of the website. Debbi works alongside Ailene to promote events and assist with the website. Claire Blackmore and Julie Beard oversee the financial management and legal aspects of the charity. Julie is also a Trustee, from 2018. Casey Pocock manages our social media and assists with fundraising.